Zapdos's official artwork from Pokémon FireRed and LeafGreen. Zapdos (サンダー, Thunder) is a fictional creature from the Pokémon media franchise. Zapdos's official artwork from Pokémon Red and Blue. 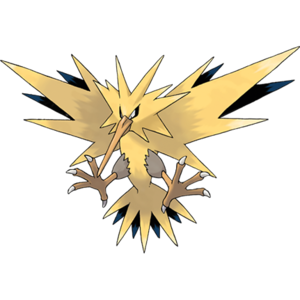 Zapdos is an Electric/Flying-type Legendary Pokémon introduced in Generation I, and is categorized within the Pokédex at #145 as the "Electric Pokémon". Along with Articuno and Moltres, Zapdos is part of a trio commonly referred as the legendary birds. Thunder Shock is a special Electric-type attack, with 40 base power and 100% accuracy. It is part of Zapdos's starting moveset in every game. Zapdos's sprite from Pokémon Red and Blue. 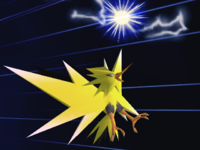 When Zapdos makes its rare appearance out of Poké Balls, it uses ThunderShock as its attack. Zapdos will discharge electricity and sparks will surround it. Any character besides the summoner that is caught in the discharge will not be able to move (but can SDI out of the electricity, as they can upon being caught in a Smart Bomb's blast radius in Brawl) and will take a lot of damage (up to 81% damage if caught by the attack at its start). The attack happens very quickly. Zapdos is featured as a collectible trophy, unlocked as one of the trophies that can be collected randomly in the Trophy Lottery, though it only appears once all characters have been unlocked. In Super Smash Bros. for Nintendo 3DS, Zapdos makes occasional appearances as a background character in the Prism Tower stage. However, it is fairly rare. It flies in from the top of the screen, and quickly arcs back around and leaves the screen again. Zapdos's trophy in for 3DS. Gazing up at dark storm clouds gathering in the sky, many children must have once wondered if the Pokémon they saw in the second Pokémon movie was in the clouds. An innocent and childish dream, perhaps... but even today as adults, the sound of thunder might just bring back memories of this Legendary bird Pokémon. Gazing up at dark storm clouds gathering in the sky, many children must once have wondered if the Pokémon they just saw in the latest movie was lurking somewhere in their depths. An innocent and childish dream, perhaps...but even today as adults, the sound of thunder might just bring back memories of this Legendary Bird Pokémon. In Ultimate, Zapdos once again cameos on the Prism Tower stage. Zapdos also appears alongside Articuno and Moltres as a primary spirit. This page was last edited on April 3, 2019, at 23:54.